Guilderland and Colonie earned victories in Suburban Council girls soccer action Tuesday, Sept. 13. Guilderland outlasted Burnt Hills-Ballston Lake 5-3, while Colonie rallied from a 2-0 halftime deficit to edge Mohonasen 3-2 in overtime. Amanda Rice and Cara Mortati each scored a pair of goals for Guilderland in its win over perennial Class A power Burnt Hills. Kerry Gerety also tallied for the Lady Dutch. 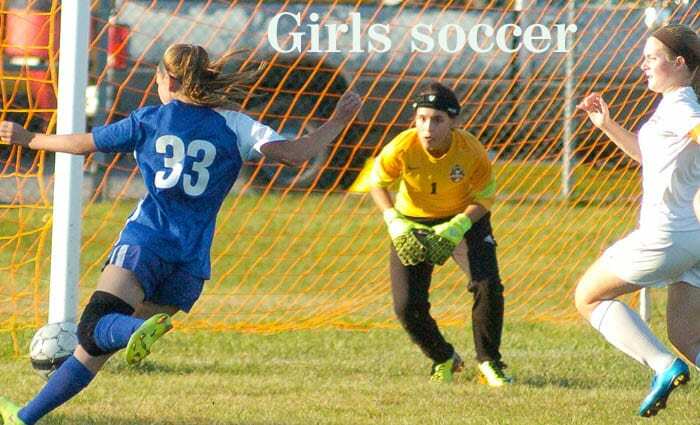 Ashley Abel had the tying goal and added an assist to lead Colonie’s rally against Mohonasen. Loryn DonVito scored the game winner with nine seconds left in overtime, and Ianah Mackey contributed a goal for the Lady Raiders. Alexandra Skoda tallied twice in the first half for Mohonasen. Elsewhere, Bethlehem settled for a 2-2 overtime tie against Averill Park in Delmar. Shannon Russo had a goal and an assist, and Sophia Calabrese added a goal for the Lady Eagles. Kristina Sanchez struck for two second-half goals for Averill Park.